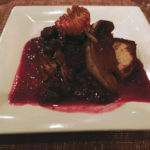 Vero News > Other Sections > Dining > Bistro Fourchette: Fabulous French fare … très bien! 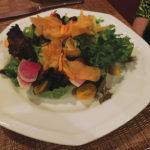 Things just seem to get better and better at Bistro Fourchette. 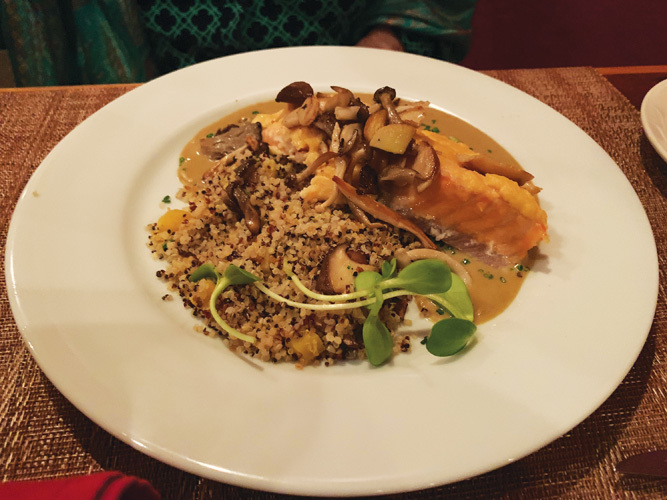 Now in its fourth year, this restaurant in the heart of Vero’s old downtown has emerged as the outpost of French gastronomy our community has been missing since the disappearance of landmark Café du Soir more than a decade ago. 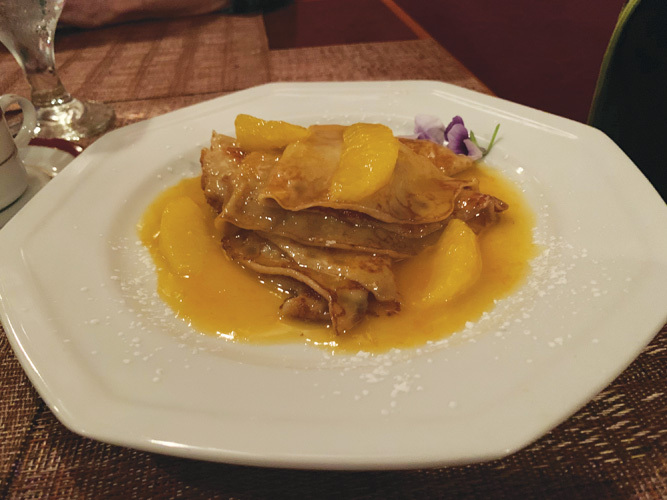 Last week, we went there on a busy night and were seated in the side room which, like the main dining room, has been very attractively redone and decorated. Our server Jon quickly took our drink order, and returned with a basket of bread. 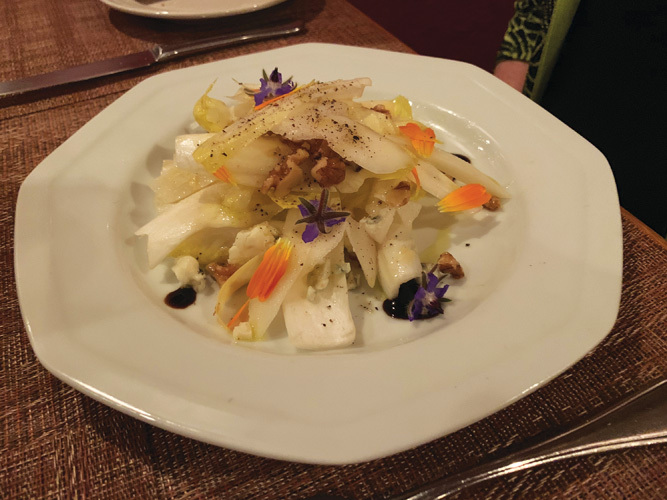 For starters on this evening, I decided to have the salade d’endive ($11), our companion chose the salade maison ($10), and my husband went for the foie gras ($19). 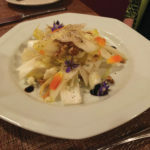 My salad was a very attractive mix of endive, sliced pears, walnuts and Roquefort cheese, with a Champagne dressing and a fig balsamic drizzle. Wonderful! 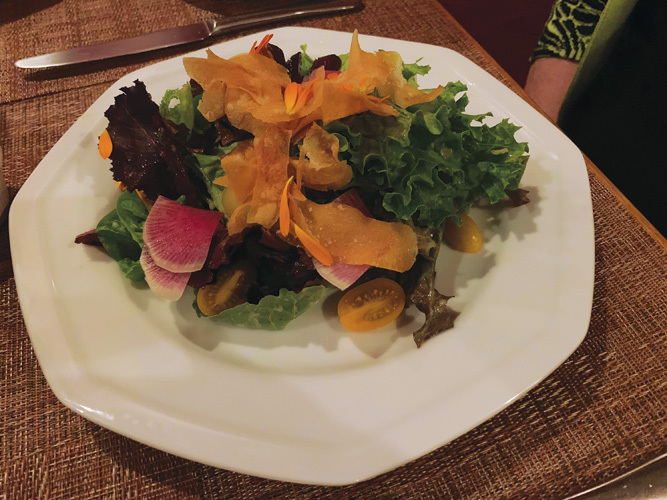 And our companion’s house salad of mixed greens, radishes and pear tomatoes was lent a delightful crunch by crispy potato strips, and dressed in a Dijon mustard vinaigrette. But my husband’s foie gras was extraordinary. 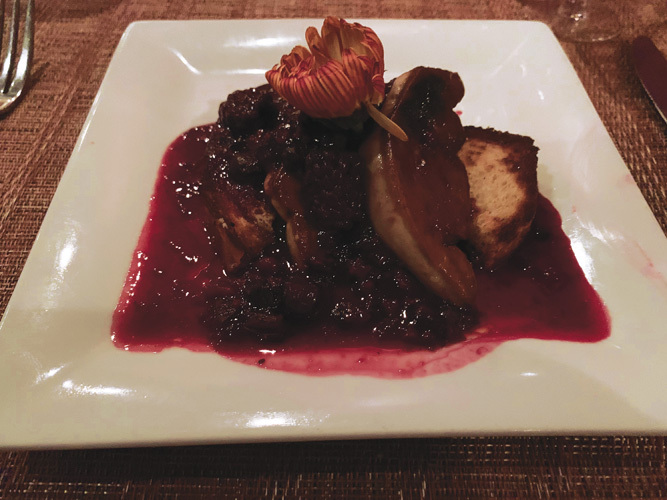 The subtle bitterness of the fatty duck liver was wonderfully counterbalanced by a sweet berry compote. And offered a choice of three wines to pair with the foie gras, he picked a Meeker Zinfandel, which turned out to work perfectly. 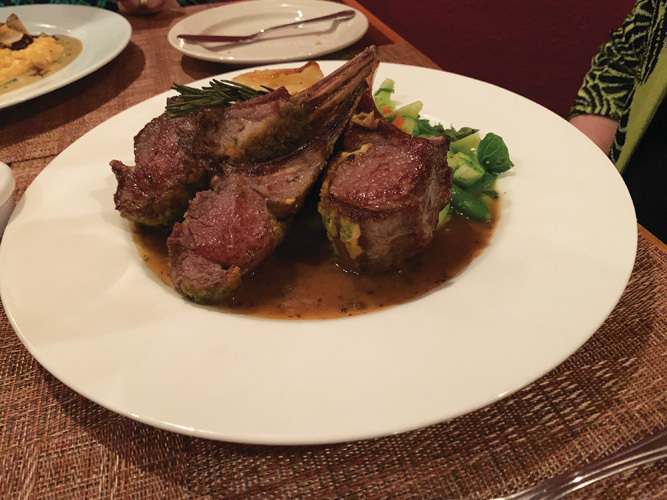 Then for entrées, I chose the Dijon herb crusted rack of lamb ($35), and our companion opted for the pan seared salmon “souffle” ($28). 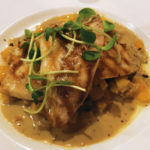 My husband, after some back and forth with the waiter, wound up with the grilled Florida pompano ($34). My husband’s first choice would have been the Beef Wellington, but longtime readers of this column will recall that he orders all beef rare. He was willing to go to medium rare on the Beef Wellington, but the server told him it would more likely be medium and quite possibly medium well. He probably should have tried it, because we saw an order going to another table and it looked luscious. Oh, well. 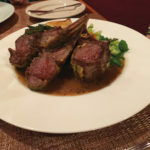 But my rack of lamb came to the table medium rare – perfection! – accompanied by Dauphnois potatoes and mixed veggies. 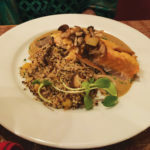 Our companion’s Faroe Island salmon was topped by mushrooms and served with quinoa in a Riesling cream sauce. 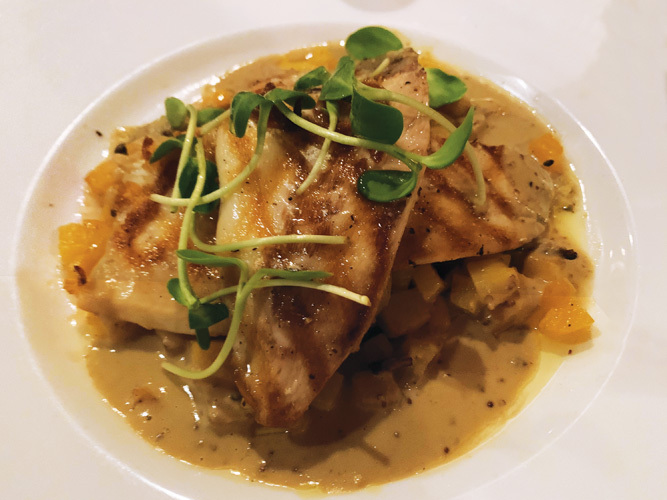 And my husband’s pompano was grilled perfectly, and served with butter truffle Savoy cabbage and rutabaga in a Pommery mustard sauce. At the conclusion of the meal, we learned (to my husband’s dismay) that the raspberry souffles had all been taken. But any disappointment vanished when we were served excellent crepe suzettes ($12) and espresso ($3) – a great end to a great meal. Chef Stephane Becht is clearly one of the best in this area. 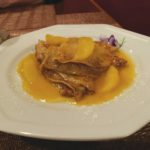 Since the specials change from night to night, you may want to call ahead if there are particular French dishes that you crave. And the heavenly souffles he makes on Friday and Saturday nights could be the best this side of the Atlantic. Becht and his wife Loretta, who runs the front of the house, have done a tremendous job in transforming the old Melody Inn into their Bistro Fourchette. It did not happen overnight, but now this restaurant seems on a roll. If you haven’t tried it, you should. Hours: Tuesday through Saturday, 5 p.m. to 8:30 p.m.